October Is the Month to . . .
Winter Is the Time to . . .
Help Us Celebrate Farm to School Month! Open Creamery Day: Maine is the fastest growing artisan cheese producer in the U.S., making almost 1 million pounds of artisan cheese per year. The Maine Cheese Guild recognizes this accomplishment on Sunday, October 11. To find creameries participating in this event, go to 2015 Open Creamery Day Participants for an interactive map of creamery locations. Fall Festivals: There are a number of fall-themed festivals throughout the state this month, celebrating everything from pigs to pumpkins. A great list, including maps, schedules, events, and cost, can be found at Maine Events. 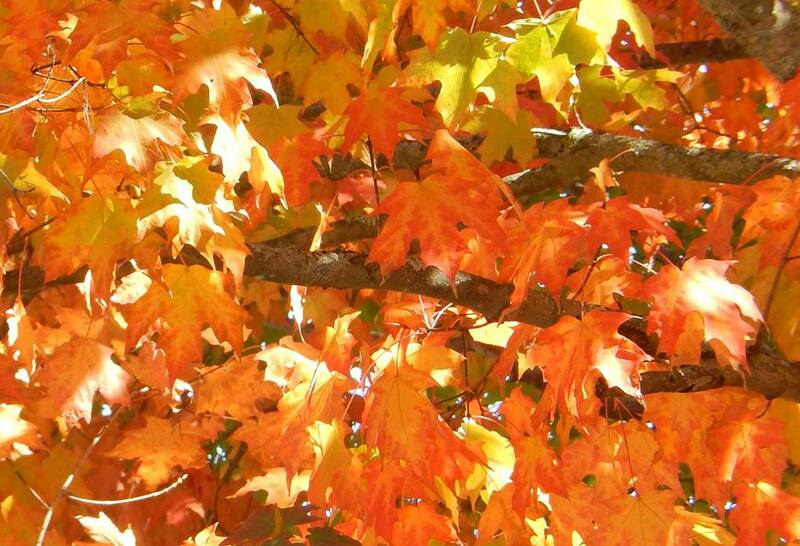 Leaf Peeping: Maine is known for its incredible fall foliage. The Maine Department of Agriculture, Conservation and Forestry produces a report of foliage in Maine, and also has a map showing the foliage status of the state broken into seven different regions. They will also provide you with regular reports of the status of foliage if you provide them with your email address. See Maine Foliage. 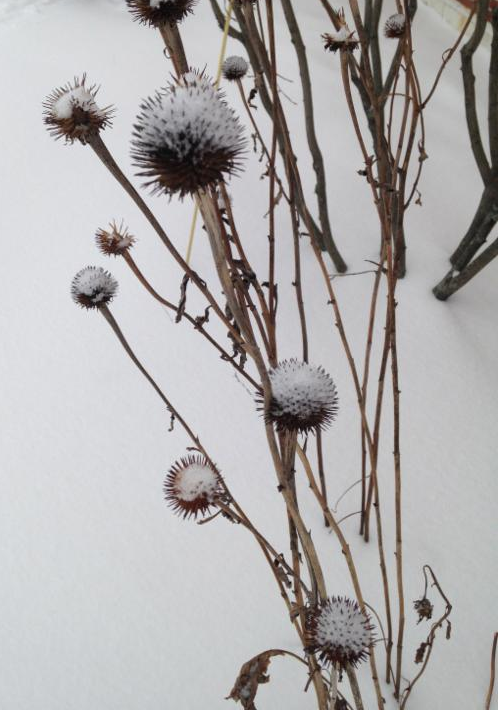 Make note of your garden successes and failures for the year. October is really the last month that you can make those final notes on how the yard and garden performed before the outdoors shuts down for winter. As the summer moves along it can be hard to keep track of yard and garden events, and recalling those events during the snow cover of winter can be difficult. Take a walk through your yard and garden(s) with a camera and notepad to do this very important end-of-year inventory. A very simple approach is to take a picture of an area of the yard and in the notepad write down the picture number, two or three things went well, and two or three things that need some thought. This not only helps you solve specific garden issues, but also helps trigger ideas when you start planning next year’s garden later in the winter. Cut grass a little shorter in the fall. We recommend you cut your lawn no shorter than three inches during the regular growing season. This height helps the grass establish a deeper root system so that during the dry periods of summer it can compete with weeds better. The taller grass also helps shade out the weeds. However, we recommend that you gradually cut the grass lower as fall progresses, with the final cut at 1.5 inches. The shorter grass gives the lawn a better jump in the spring, as there is less an opportunity for the grass to matt or clump overwinter. Remove lawn clippings…or not. In some situations, clippings should be removed from the site. For instance, remove clippings from a weedy lawn to prevent weed seeds from growing and taking over your lawn. If mowing a very tall lawn, rake off the clippings because if left in place, the clippings shade the lawn and create a moist environment that favors disease development. 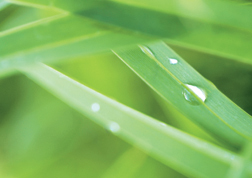 Grass clippings that are removed from a lawn can be composted, unless they contain an herbicide from a recent application of a weed-killing chemical. Otherwise clippings should be left in the lawn to help provide organic matter. Mulch winter-sensitive plants and perennials. After a few heavy frosts, place 2 to 3 inches of mulch around the base of the plant. Good mulching materials include leaves or straw. The mulch will also serve as a soil amendment next growing season. Plant spring bulbs. In order to start next spring with a burst of color, even as snow is still piled up in places around the yard, plant daffodils and tulips now. A good primer on planting tulips is available from the University of Illinois Extension: Bulbs & More: Planting & Care. Dig up dahlia tubers and gladiola corms. Dig up tender bulbs, corms, tubers, and roots (canna lilies, dahlias, and gladiolas) after their foliage has died back or has been killed by frost. Let them dry in a well-ventilated room, with temperatures between 60º – 70°, and out of direct sun. Most tender plants will take 1-3 days to cure; gladiolas can take much longer — up to 3 weeks. To store the cured materials, place them in a ventilated container and layer them with peat moss, sand, and shredded newspaper or sawdust. Store them in an area with temperatures ranging around 35 to 45º. For more information, check out University of Minnesota Cooperative Extension’s Storing Tender Bulbs and Bulblike Structures. Plant garlic. The end of September though October is the time of year to plant garlic for next year’s harvest. Planting at this time will allow the garlic cloves time to set roots so they will have a jump start next spring. If you plant later or even next spring, the plant will mature before the bulb can gain size, and you’ll be left with very small garlic bulbs for harvest. For more information, see Bulletin #2063, Growing Hardneck Garlic in Your Maine Garden. Be mindful of hazardous trees in your landscape. If you have potentially unsafe trees on your property, have a licensed arborist evaluate and take care of weak limbs or whole trees before winter storms make them a real issue. 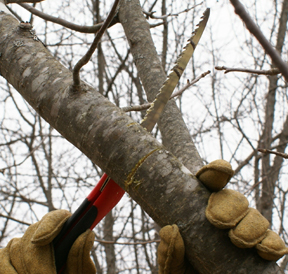 For information on smaller do-it-yourself pruning projects, check out our pruning resources. Use items from nature to decorate empty window boxes and containers. Sumac fruits, sensitive fern fronds, winterberry, dried flowers (hydrangea, sedum, etc. ), and seed heads tucked in nests of fir boughs are an enjoyable sight as the snow flies. Keep composting. Store those plentiful and very useful fall leaves in a large covered bin now and use them to cover your to kitchen scraps when you add them to the compost through the winter. The composting process will slow when temperatures drop, but will pick back up in the spring. Excess leaves also make great mulch for the garden when shredded with a lawn mower. Give a great gift. For friends and family members looking for gifts for a gardener, University of Maine Cooperative Extension Ornamental Horticulture Specialist Lois Berg Stack suggests books for inspiration, tools, gloves, memberships to botanical gardens and garden clubs, magazine subscriptions, or gift cards to a favorite seed company or nursery. In addition, gifts from the gardener include herbal vinegars, infused oils, a garden design, dried herbs, a gift certificate for an hour of weeding, potted herbs for the winter windowsill, and those fabulous pickles you made last summer. Practice food safety. UMaine Extension food safety experts have prepared a number of resources for specific situations (tailgating, hiking, gift giving, Thanksgiving, etc. ), audiences (age 60 and over), and food items (cider, eggs, fiddleheads, canned goods, etc.) as well as some basic food handling, hand and food washing tips. Knowledge is key to preventing food borne illness. More resources are listed here. Note plants with winter interest to add to your landscape. Bright red branches, ornamental bark, persistent fruit, or interesting growth habits can all be lovely features to enjoy in a winter garden. Use these observations to make a shopping list for your spring garden center outings. Stay fit. Gardening can be quite strenuous. Staying flexible and strong can help minimize those aches and pains of early season gardening adventures. Try new recipes for crops you plan to grow. Did you get overwhelmed with cherry tomatoes last year? Take time to find new recipes for those bountiful crops so you can enjoy every bit of the 2016 harvest. Connect with your local food pantry or homeless shelter to find out what vegetables are most wanted by their patrons and plan to devote some of your garden space for Maine Harvest for Hunger. Storage crops such as onions, carrots, beets, and winter squash are typically easier to handle for food distribution sites with limited refrigeration space or infrequent distribution days (i.e. only open once or twice a month). Mark your new calendar with notes about when to start seeds and scout for garden pests, who to contact when you’re ready to donate some of your harvest, and upcoming educational events. Grow your own sprouts. Homegrown, crunchy greens can be yours with only a few simple materials: mason jar with screw-top ring, small piece of cheesecloth, aluminum foil, and sprouting seeds. Learn how (PDF). 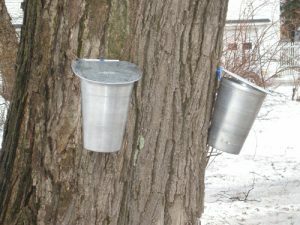 Tap maple trees. The exact best time to start depends on the weather. Watch for when temperatures are freezing at night and 40-45oF during the day. Learn how. Care for garden tools. Tools should be cleaned off after every use. For those not always mindful of tool upkeep, make routine cleaning your New Year’s resolution! Invest in a wire brush and collect some rags for wiping them down, sand down rough handles, wipe with linseed oil, consider painting wooden handles with a bright color to make them easier to find and distinguish from other gardener’s tools, and sharpen blades. If you don’t feel comfortable sharpening your own tools, your local hardware store may offer a sharpening service. Learn how to identify the trees in your woods. 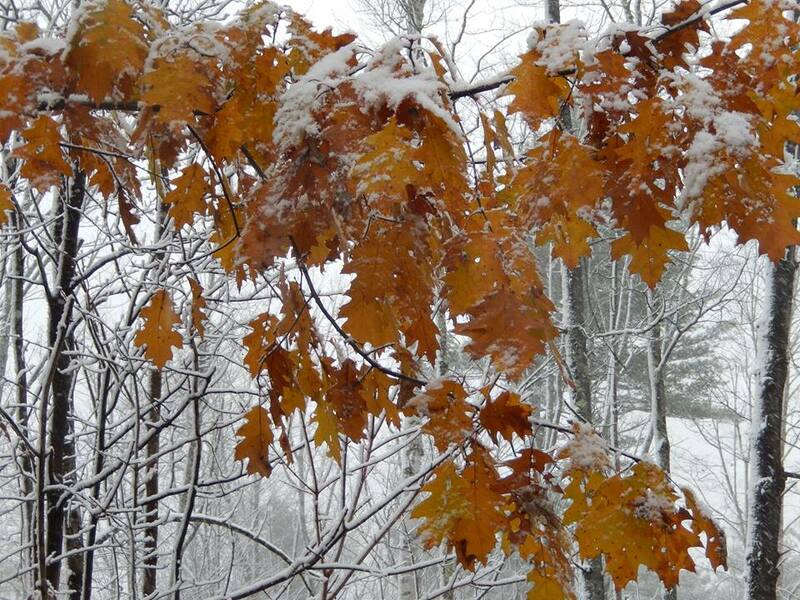 Forest Trees of Maine, written by the Maine Forest Service, has a fantastic winter key to native trees of Maine. This resource is available in print at area bookstores and is fully accessible online for FREE. Click here for the full book. Start seeds indoors. This great gardening tradition fills gardeners with hope of a colorful and flavorful year ahead. New and seasoned seed starters should check out the great resources from UMaine Extension and MOFGA about how and when to get started. Remember to refer to our bulletin Vegetable Varieties for Maine Gardens to select good performers for our climate. October is National Farm to School Month, a time to celebrate the connections happening all over the country between children and local food! Throughout October, follow the National Farm to School Network on Facebook, Twitter, and Instagram to see how communities are celebrating; include the hashtags #farmtoschool and #F2SMonth in your social media messages; and, visit farmtoschool.org to read great stories about farm to school’s impacts and successes. New to farm to school? Register to attend the Farm to School 101 webinar on Tuesday, October 13 from 12-12:30 p.m. CT for a look at how the movement is working to connect millions of kids to healthy, local food. Whether you are a food service professional, farmer, fisherman, teacher or food-loving family, there are plenty of ways to celebrate National Farm to School Month! Visit farmtoschool.org to learn more. Farm to School in Maine has been growing steadily since the first Maine Harvest Lunch program in 2003. The Maine Department of Education Child Nutrition Services encourages schools to purchase local products throughout the year with an emphasis on the Fall harvest during the last full week of September. Maine schools will be submitting recipes using local products to Maine DOE’s “A Fresh Take on School Meals” Harvest Lunch Contest with winners to be publicly celebrated at the upcoming Maine Farm to School conference on Friday, October 16 at the campus of Kennebec Valley Community College-Alfond and Maine Academy of Natural Sciences in Hinckley. To complement Maine Harvest Lunch Week and highlight the use of school gardens as classrooms, Maine School Garden Network (MSGN) encourages schools to hold “Open House” events in their school gardens that same week. Students plant, tend, and harvest produce in schools throughout Maine as noted by the over 120 school gardens registered in the MSGN directory. 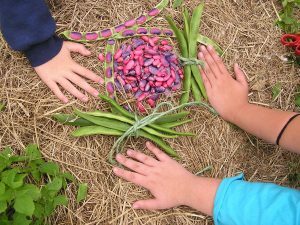 A key ingredient of Farm to School programming, gardens not only teach students about where their food comes from, they also provide an experiential classroom for all areas of the curriculum. Hands-on learning engages the body, mind, and spirit, and cements learning standards in real-world activities. Another component of Farm to School practices are lessons on nutrition and agriculture that complement the efforts of food service staff to introduce and educate students to food grown in their environment. Maine Agriculture in the Classroom has created Teach ME about Food and Farms, a website for teachers with searchable lessons related to agriculture. Community organizations, Healthy Maine Partnerships, and local UMaine Extension county offices can also be great resources for lessons related to food, health, and agriculture. Several schools have created their own garden-based curriculum such as the award-winning Troy Howard Middle School (THMS) in Belfast where students learn in the school garden, greenhouses, and outdoor kitchen. “School Garden Grown” stickers sponsored by MSGN were seen on over 120 vegetable entries at the recent Common Ground Country Fair in Unity, many of them from THMS. Another school with a unique program over 26 years old is the Medomak Valley High School Heirloom Seed Project. Through the study of heirloom seed varieties, methods of growing them for seed production and marketing/selling them worldwide, students are immersed in every subject area. Produce is also provided to the cafeteria for schools meals. With the help of an AmeriCorps VISTA member, a summer Teen Ag program was added several years ago to help maintain the growing gardens and historic tree arboretum while also teaching the students important skills related to the business of agriculture. This program has also had the support of FoodCorps, a nationwide team of AmeriCorps leaders who connect kids to real food and help them grow up healthy. 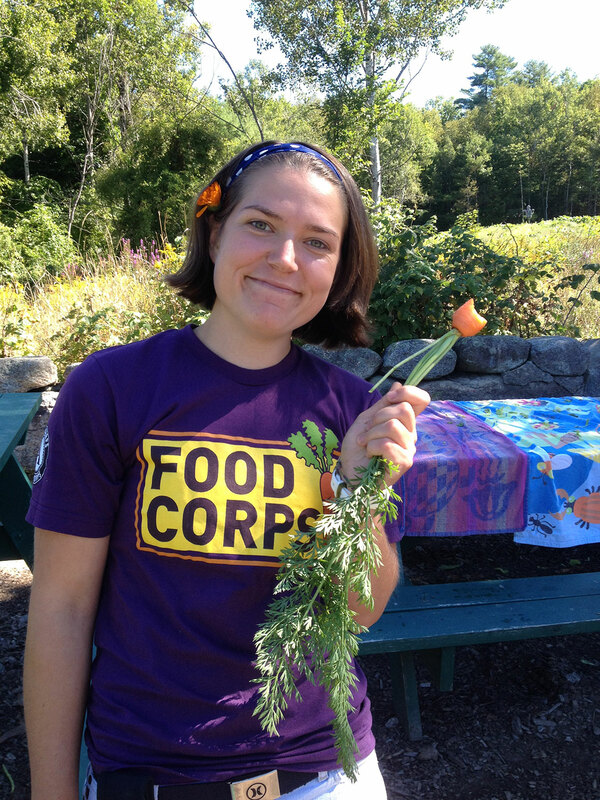 Twelve FoodCorps members are serving in schools throughout Maine this year with service sites in local communities. The program is hosted by University of Maine Cooperative Extension and is helping us provide direct support to schools for farm to school activities such as taste tests, cooking lessons, garden-based learning, and connecting local food producers and schools. To learn more about what our twelve members are doing, follow them on their Facebook page. Volunteer with a school in your community. They may need help conducting a local foods taste test, harvesting from their garden, reading a story about agriculture, chaperoning a farm field trip, bringing a recipe using local food to a school event, etc. Come to the Maine Farm to School conference to network with teachers, food service staff, community leaders, and volunteers, and find out how you can stay engaged with Farm to School all year long. Eat kale on National Kale Day, October 7! Read inspiring stories about farm to school practices happening throughout the country at the USDA blog, the National Farm to School Network blog, and the national FoodCorps facebook page. To learn more about what is happening throughout Maine to connect kids to food from land and sea, please join us at the 2015 Maine Farm to School conference on Friday, October 16! Ellie Libby is an Extension Educator for 4-H youth development in Knox and Lincoln Counties. She is a 1993 graduate of the Master Gardener Volunteer training. Ellie is the former Maine supervisor for FoodCorps, board member of Maine School Garden Network, chair of the Maine Ag in the Classroom Council and co-state lead with Renee Page for the National Farm to School Network. 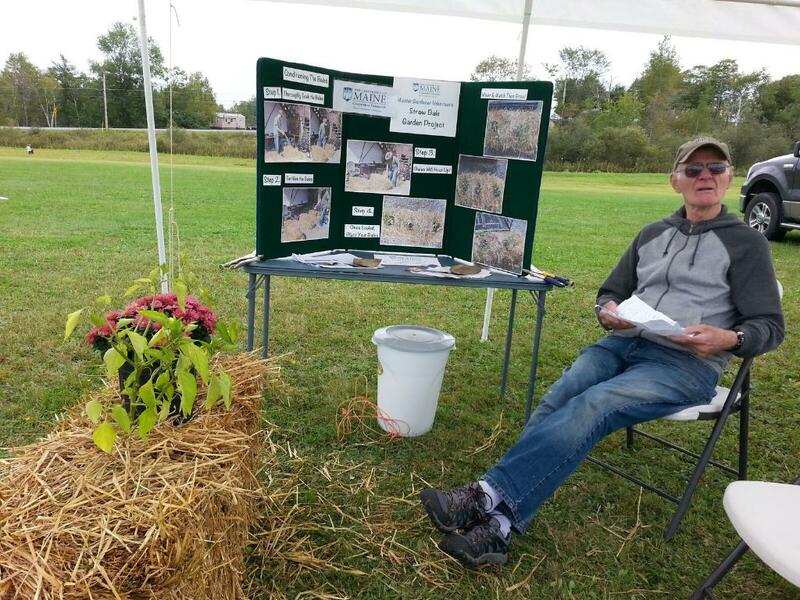 John Beraud of Houlton is a recent 2015 graduate of the Aroostook Master Gardener Volunteer program, but has been an avid gardener for most of his adult life. At age 80, he continues his love for gardening by sharing his experiences with others as a Master Gardener Volunteer. John’s first garden was on Long Island in the late 60s. It was small, about 8′ x 20′, but very productive and John marvels that “I grew everything in there.” He also grew dwarf peach, apple, and cherry trees on his small lot. When he met his wife Pat, they continued to have at least a small garden wherever they lived, although he admits, “it was a real challenge” to grow almost everything in Arizona. When asked what he enjoyed most about the Master Gardener Volunteer course, John said that he appreciated the fact that it helped him to learn how to look things up on the Internet. “You can’t know everything, no one can know everything,” and he feels that his newly developed computer skills are more effective in helping him to find answers to his gardening questions. He also appreciates learning more about pruning trees and has already enjoyed putting his new knowledge and skills to real practice. He spoke of watching a neighbor lopping limbs from a fruit tree in his yard and when John offered to show him how to do it properly, his neighbor was delighted to learn the basic whats and whys of pruning. It was a satisfying experience for John to share this information while helping others. 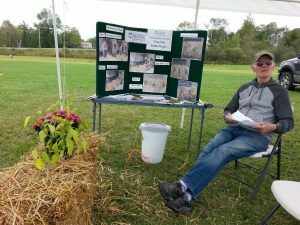 John’s MGV Project for the summer was creating a Straw Bale Garden at his home and presenting a demo/display at the Northern Maine Rural Living Day in September. John and his wife Pat are in the process of moving to Georgia to support John’s brother as he deals with illness. They will miss the Houlton community, but not Northern Maine winters! 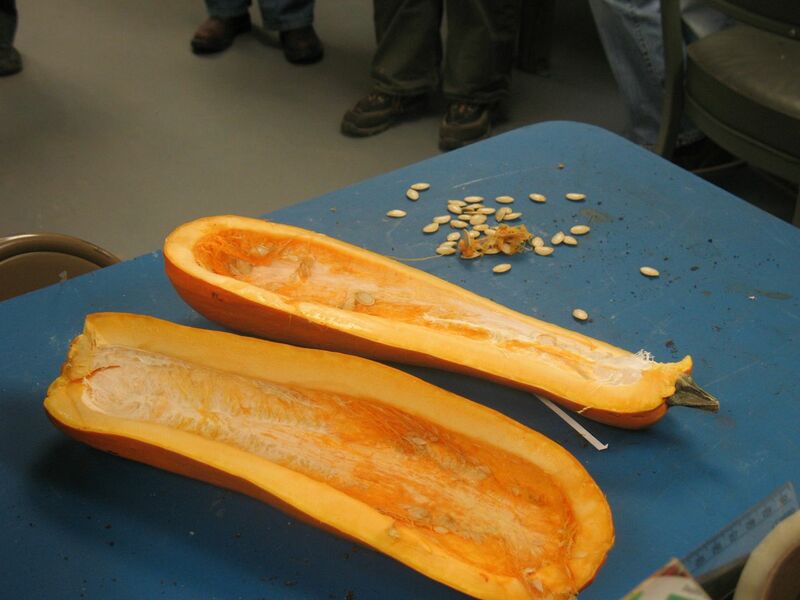 Maine-grown winter squash is available September through February. Acorn, butternut, buttercup, Hubbard, and spaghetti are all different varieties of winter squash. The thick and tough outer skin of winter squash can make it difficult to prepare. The steps below will make using winter squash easier this fall and winter. Wash squash under running water and dry with a clean towel. Once the squash is cool enough to touch, dice the squash with a knife without cutting through the skin and scoop out the diced pieces or scoop out the flesh. Use the cooked squash in recipes, or mash with a fork and enjoy! This material is provided by Iowa State University Extension and Outreach. For more tips like this, visit the Spend Smart. Eat Smart. website. If you are interested in freezing or canning green or yellow beans from your garden, review the following UMaine Cooperative Extension Bulletins: #4382, Canning Vegetables in a Pressure Canner or #4384, Freezing Vegetables. If you are interested in the nutritional value and how to store winter squash, review bulletin #4176, Winter Squash and Pumpkins.